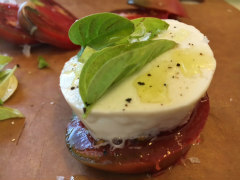 Learn how to pull your own fresh mozzarella and watch a demonstration of fresh ricotta! Professional cheesemaker Jeanine Dargis will guide you through the process from milk to curd to finished cheese. You will also indulge in a cheese tasting with helpful tips on how to taste and critique any cheese like a pro, in addition to eating your homemade mozzarella and ricotta in a Caprese salad with accompaniments - Bring your own wine! Depart with any leftover mozzarella and curd along with recipes and recommended reading. Please read: Registration closes on Thur May 9th. A $20.00 materials fee will be collected at time of registration.